K&K Keramik is well known for a variety of beautiful hand-made pottery and rum pots. K&K also makes Gartopf Fermenting Crocks with the same high quality standards and beauty. These “From 1 Kerazo” fermenting pots are hand crafted, made in Germany, designed in the 100 year old traditional tubular shape with side handles and come complete with pot, lid, weighing stones, and recipe book. This crock is very attractive, sturdy, easy to use and quite functional. 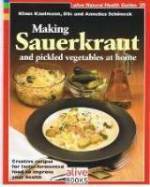 Make natural nutrition-packed sauerkraut and pickled vegetables with this stoneware crock pot from Germany! Through the years, sauerkraut has been recognized as one of the healthiest foods, and was even used on sailing ships to protect sailors from scurvy. Natural lactic acid fermentation is one of the oldest and healthiest means of food preservation. It allows natural, beneficial bacteria to perform a fermentation process in which vegetables develop a pleasantly sour taste and remain rich in vitamins and minerals. Lactic acid fermentation is the only method of preservation that retains all the natural plant ingredients while improving the quality, taste and aroma. To determine which size pot is best for you please look at the information below. Remember you can only fill a pot to 80% of its total capacity. We ship all of our Fermenting Crocks double boxed with cushioning materials between the boxes. From nubbin of Dearfield, Illinois on 9/28/2016 . Appearance is pleasing. Everything I was looking for in a kraut decanter. Know I will enjoy for many makings. From Glenn of Eureka, California on 8/8/2016 . We are buying the 10 L FORM 1 (2.6 Gal) K&K Keramik German Made Fermenting Crock Pot Kerazo F1. We bought a 5 litre crock pot from you a couple of years ago and still talk about the unbelievable packaging you did then. Because of that we are choosing to buy this one from you as opposed to some other seller. In other words, we looked for you. From Nimpha Daluddng of Pittsburgh, Pennsylvania on 2/11/2016 . 1/4/2015 – I have a Harsch Crock and wanted another. this looks like what I have but the name is different. Is this the same? ?